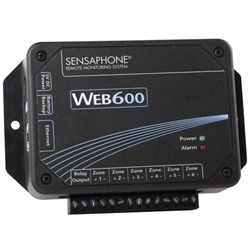 The Sensaphone WEB600 Monitoring System is a low-cost monitoring solution for smaller scale applications such as a computer room or vacation home. The WEB600 also includes a broad temperature sensing range (–109°F to 168°F) and data logging; making it an ideal candidate for food and medical storage. Conveniently check the status or make programming changes via the Web600’s internal web page from any web-enabled device. This simple-to-use, clean user interface makes programming and setup simple. Sensor Inputs: Connect up to six external sensors to monitor a variety of equipment and conditions. Each input zone can be connected to a temperature sensor, an analog transducer, or a dry contact switch. Web Status: Live status and history is only a webpage away. The Web600 built in web server provides quick and easy information about your monitored conditions. Even time stamped history reports are readily available online. Alarm Notification: When monitored conditions exceed normal values, the Web600 will notify you immediately by sending out e-mail alarm messages, and even text messages. Up to eight people can be contacted to make sure that proper action is taken. Web Programming: Built in web server for easy access to programming and status. Just point your browser to the Web600's webpage and fill in the blanks for a quick configuration. Optional battery backup: With the addition of the optional battery backup module, the Web600 can monitor for power failures and stay operational for two full hours while the power is out. 5.5" x 3.25" x 1.25"